Missouri celebrates National Manufacturing Day! 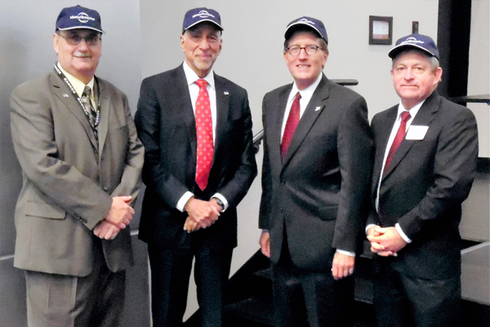 During a ceremony on October 3, 2016, at Ranken Technical College in St. Louis, Missouri Department of Economic Development Director Mike Downing joined officials from Ranken Technical College and Missouri Enterprise to mark the celebration of the 5th annual National Manufacturing Day. The event, attended by nearly 50 manufacturers, public officials and educators, was one of more than 50 held across the state this week to help the public understand the importance of the manufacturing industry on Missouri’s economy. To celebrate these achievements, DED Director Mike Downing presented a proclamation during the event from the State of Missouri designating October 7, 2016, as Manufacturing Day in Missouri. Thanks in part to state incentives including the Missouri Works Program, Missouri is today home to more than 6,500 manufacturing firms, which together employ 260,000 Missourians and contribute $36 billion (13 percent) to Missouri’s total Gross State Product (GSP). In 2014, the state experienced its best year for manufacturing job growth in two decades, and is currently leading the Midwest in advanced manufacturing job growth with more than 26,000 advanced manufacturing jobs created in the Show-Me State since 2010. Earlier this year, the Brookings Institution ranked Missouri No. 8 in the nation for growth in advanced manufacturing output, as well as No. 6 nationwide for annual advanced manufacturing job growth. When combined with growth in Missouri’s other industries, the state recorded an all-time high of more than 2.82 million active jobs in August 2016. Playing a key role in this growth is Missouri’s automotive industry, which today employs 24,000 local workers. Since 2010, more than 60 automotive plants and parts suppliers have embarked on Missouri expansions, together creating or retaining more than 16,200 jobs and investing more than $2 billion. Last year, automotive production in Missouri surged by 24 percent, the second most in the nation in terms of growth, with more than 630,000 vehicles rolling off Missouri assembly lines. Additionally, employment at both the Kansas City Ford and Wentzville GM assembly plants has doubled in recent years, and the plants now manufacture some of the best vehicles in the nation, including the Ford F-150 pickup (2016 bestselling vehicle), Ford Transit van (2016 bestselling van), Chevrolet Colorado (2016 Motor Trend Truck of the Year), and GMC Canyon (2015 Autoweek Best of the Best Truck). Manufacturing growth has also contributed greatly to Missouri’s export sales growth. Over the past 10 years, Missouri has recorded record export sales figures, with annual exports increasing by nearly 30 percent. The years 2014 and 2012 were the best on record for Missouri export sales. This summer, the state released export figures through the second quarter of 2016 finding that transportation equipment topped export sales with just over $2.5 billion, a nearly 90 percent increase from the same quarter in 2015. Thank you to Missouri Enterprise, as well as our many other partnering agencies throughout the state, for strengthening our manufacturing industry! Happy Manufacturing Day, Missouri. Keep up the good work!